The appearance of Mercedes-Benz, Smart, AMG and Maybach was concentrated on the inside of Frankfurt’s festival hall, which had its 100th anniversary this year. With its once visionary steel structure it was Europe’s biggest self-supporting hall. 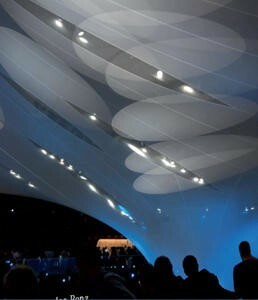 A light membrane structure of mesh PVC fabric spans over the exhibition room. It consists of 110 panels in which are included lens-shaped cuts for the spotlights to illuminate the cars. A steel cable spans the membrane structure to the outer border of the existing steel structure. With two rings and a pneumatic membrane ball with 13m cone tops and low points as well as a room designed full of suspense with different biaxial bended surfaces are formed. The PVC membrane surfaces are also used as light and projection sails.